Road related traffic crashes are a leading cause of death and injury in the US. Every hour 150 children between the ages of 0-19 are treated in emergency departments for injuries sustained in motor vehicle crashes. Tehama County Public Health is committed to protecting youth from traffic related crashes and we do this by providing resources and promoting occupant, bike and pedestrian safety education. Knowing which seat your child should be in and how to install it is no easy task. Our Certified Car Seat Technicians on staff have gone through extensive training and can help you learn how to find the right seat with the right fit for your child. There are 4 different types of car seats; Infant Carriers, Convertibles, Combinations, and Boosters. Each seat has different weight/height requirements as well as an expiration date. It’s also important not to use a seat that has been recalled or one that has been in an accident. As of January 1, 2017 state law regarding car seats have changed, contact our office for more details. 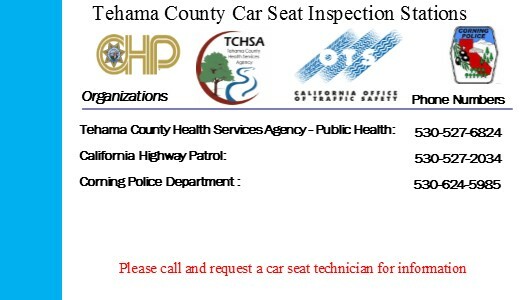 Throughout Tehama County there are a number of car seat inspection stations available where you can have your car seat checked. Download the pdf for more info. The Tehama County Health Services Agency is committed to a healthy community using health education, prevention, assessment, early intervention, and treatment with follow-up when necessary. We encourage active participation from residents while keeping confidentiality.